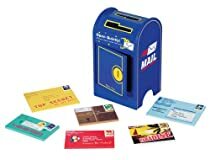 This hand-painted wooden mailbox features three big slots for sorting various sizes of included mail, plus interchangeable stamps that stick magically to each letter. The mailbox includes two doors that open to remove mail — one opens magnetically and one opens using the included key. Measures 15.8″H x 9.8″W x 9.2″D.